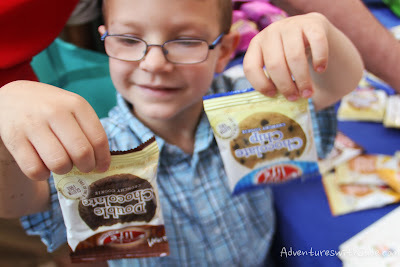 Adventures with Jude: Food Allergies Rock Giveaway!! Note: This post contains affiliate links. Thanks for your support! 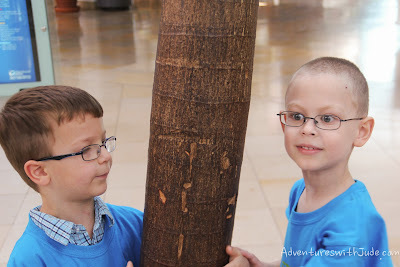 Last Sunday, we went to the Kids with Food Allergies Strides for Safe Kids Walk and Expo. This year's event was the 5th annual benefit. 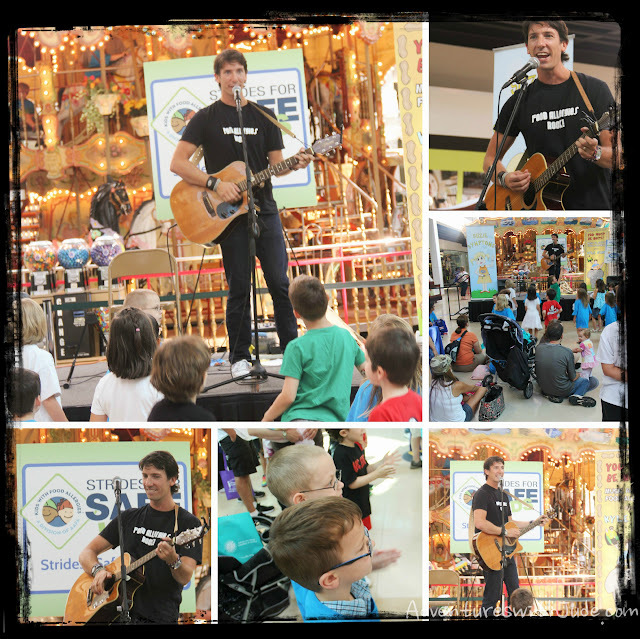 It's a combination fundraiser, product expo, concert by Food Allergy Rock Star Kyle Dine, and party for kids with food allergies to meet each other and know there are tons of other kids just like them. Our family was especially excited to attend, because Mrs. Jessica and the Professor from Schooled by the Professor came to Expo. 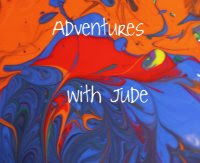 It was the first time Jude and the Professor met. His mom and I have long said they are brothers, separated by birth. They are almost identical from personality to looks, even the glasses they wear. The only obvious-at-first-glance difference is Jude is about an inch shorter and has slightly longer hair. I had my camera ready to capture the very first moment they saw each other. They just stared, then Jude pulled his glasses off, and squeaked, "HUH???" They ran off together and became thick as thieves. The boys enjoyed the Mall Walk. They were each given little guitars and trailed Kyle in leading everyone. At the end, they had a mini jam session. After the walk, we got to mingle with everyone, and check out the vendors. Jude found his favorite Enjoy Life "crunchy cookies..."
...and his even more favorite EO28. Around here, they are nicknamed "Chuggie," because when Matthew had to drink them, he'd get so easily distracted that that we'd finally say "Just CHUG it and be done already!" When Jude saw them, he gasped, "My CHUGGIE!! Mommy, they have my chuggie!!" The Nutricia sales rep was astonished -- let's just say that elemental formulas are an acquired taste and most kids avoid it like plague. Not Jude -- at one time, he would drink so many of them that he'd be too full to eat - we had to start putting it where he couldn't reach it and ration the boxes. He has outgrown his need for them and has a full enough diet, but he hasn't outgrown his love for them -- he drank it right down! Then Kyle started to play again. Kyle is a unique musician. Since childhood, he has been allergic to a number of foods, and on Christmas Day 2005 had a near-fatal anaphylactic reaction. This changed him - both in how he handled his allergies, and in what he felt his calling was. 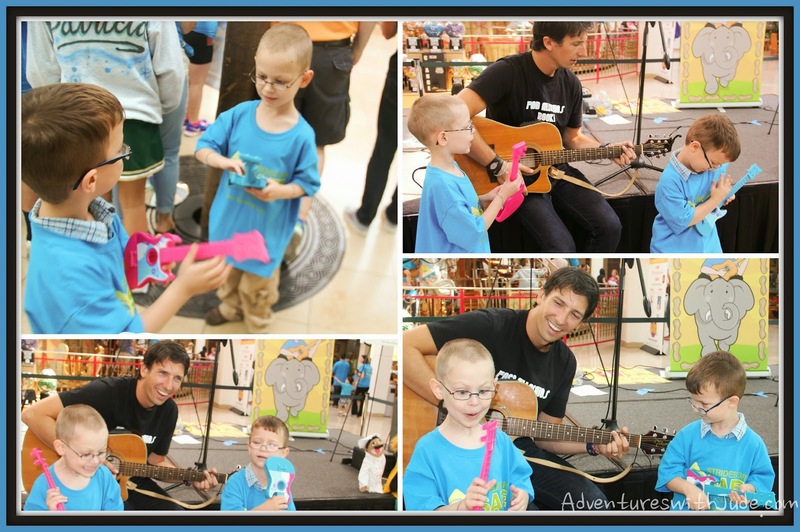 He picked up his guitar and began writing songs for children about living with food allergies. This is an interview and short performance from Kyle. We had a fantastic time singing and grooving to Kyle's music. Our family has been huge fans of Kyle's for a long time, own both of his CDs - You Must Be Nuts! and Food Allergies Rock! and listen to them often. We had a fantastic time! Our gang has so many food allergies and the kids often feel left out of parties. The best part of this day is that almost all the kids there have allergies. At the food tables, they see everybody reading labels - even if it's the same snack they have at home. We all have the same rule -- EVERY LABEL, EVERY TIME. Many families come every year, so we got to see old friends again, too. In the past, I have worked at the event as a volunteer, but this year I chose not to since I was taking Jude by myself -- he was able to handle the crowds for a while with me by his side, but eventually got overwhelmed and we had to say goodbye a little early. He's looking forward to next year when he can see The Professor, Kyle and his other friends again! To celebrate the event, Adventures with Jude is teaming up with Schooled by the Professor and giving away a Food Allergies Rock Package! The first item in the package is a KFA oversized emergency medicine bag. It's perfect for holding epinepherine and antihistamine, inhalers and spacers. Second is a Cup-a-Cake container. Many food-allergic kids have to bring their own treats to parties to avoid allergens, and this is a great way to keep your cupcake from being squashed on the way there. 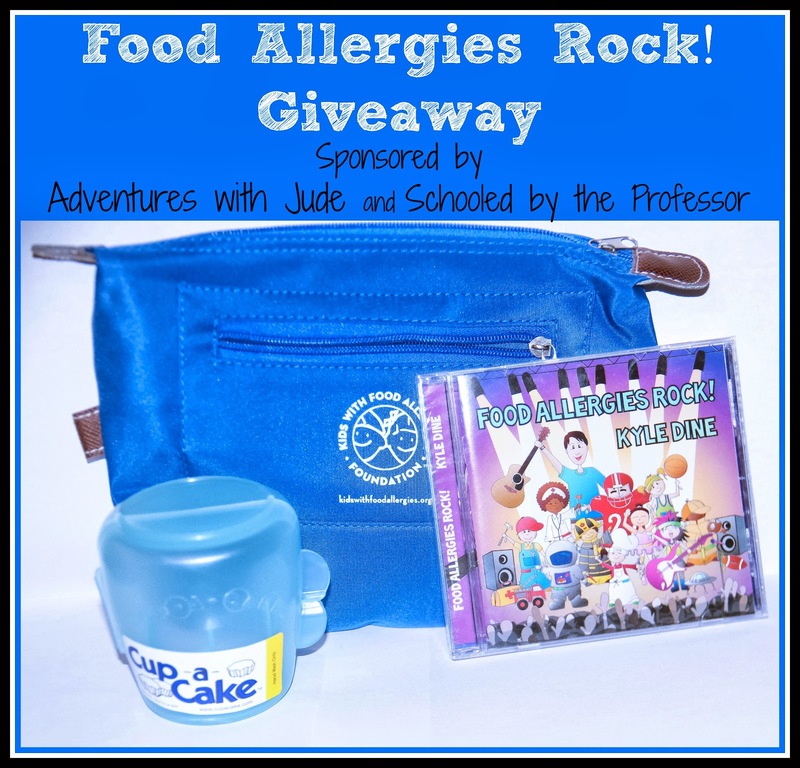 Finally, Kyle Dine has graciously donated a copy of his latest CD, Food Allergies Rock! so that your family can enjoy Kyle's empowering music. Finally, a little bit about the Kids with Food Allergies Foundation. This is an organization very, very dear to us. 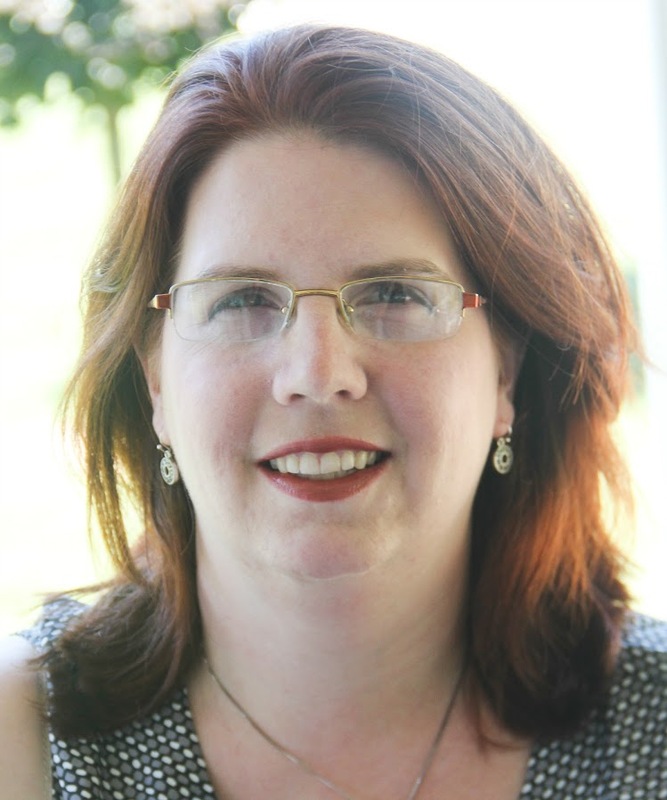 KFA is an online support group for families, helping them navigate the day-to-day issues that arise living with food allergies - from "just" avoiding a food or two (like Luke) to kids who have elemental diets and feeding tubes (like Damien and Celia) to homeschooling kids with food allergies (like Jude!). Through their HON-Code certified website, they facilitate parent-to-parent support that includes community forums, photo and video sharing, live chat events, and a blog written by both volunteer staff and members of the Medical Advisory Team. The folks there have been our biggest support over the last almost 10 years of living with food allergies, and I am blessed to call so many of the moms I have met there my best friends. KFA's annual fundraising campaign and incentive program runs through Sunday, September 22. There's no requirement to donate to enter the raffle, but if you know a family living with food allergies, I would ask you to consider giving to the campaign. KFA is a 501 c3 non-profit and relies on the generosity of others. Every little bit makes HUGE difference in making the lives of our kids better. UPDATE! Congrats to Cristi S., the winner of the prize package!! Rock on, Cristi! 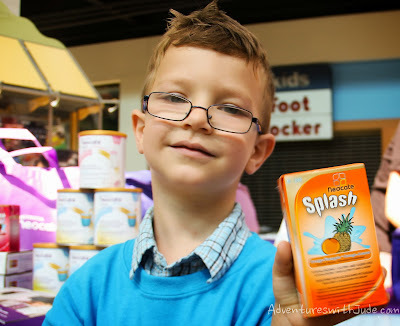 My son is allergic to coconut and dairy. We have to be very diligent with him as he is quite young, and is still learning what he can and can not have. As far as we know, we don't have any food allergies. I have one peanut allergic kid, one on a top-8 free elimination diet for eosinophilic esophagitis, and I'm both milk-free and gluten-free. I have a peanut allergy, egg allergy, walnut allergy, and we try to stay away from gluten because I have a child on the spectrum.